Illustrations note XVI, 364 p.
Peter Dalgaard is associate professor at the Department of Biostatistics at the University of Copenhagen and has extensive experience in teaching within the PhD curriculum at the Faculty of Health Sciences. He has been a member of the R Core Team since 1997. Basics. - The R environment. - Probability and statistics. - Descriptive statistics and graphics. - One and two sample tests. - Regression and correlation. - ANOVA and Kruskal-Wallis. - Tabular data. - Power and the computation of sample size. - Advanced data handling. - Multiple regression. - Linear models. - Logistic regression. - Survival analysis. - Rates and Poisson regression. - Nonlinear curve-fitting. - Obtaining and installing R and the ISwR package. - Data sets in the ISwR package. - Compendium. - Answers to exercises. - Index. "...extensive, well organized, and well documented...The book is an elegant R companion, suitable for the statistically initiated who want to program their own analyses. For experienced statisticians and data analysts, the book provides a good overview of the basic statistical analysis capabilities of R and presumably prepares readers for later migration to S...The format of this compact book is attractive...The book makes excellent use of fonts and intersperses graphics near the codes that produced them. Output from each procedure is dissected line by line to link R code with the computed result...I can recommend [this book] to its target audience. 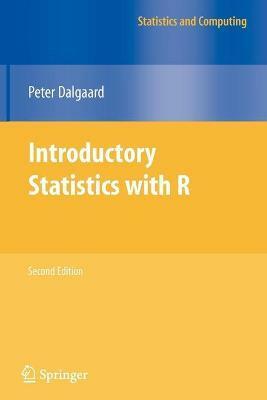 The author provides an excellent overview of R. I found the wealth of clear examples educational and a practical way to preview both R and S."
Peter Dalgaard is associate professor at the Biostatistical Department at the University of Copenhagen and has extensive experience in teaching within the PhD curriculum at the Faculty of Health Sciences. He was chairman of the Danish Society for Theoretical Statistics from 1996 to 2000. Peter Dalgaard has been a key member of the R Core Team since August 1997 and is well known among R users.